These gluten-free Honey Apple Spice Scones are not very sweet, making them the perfect match for lashings of homemade jam. 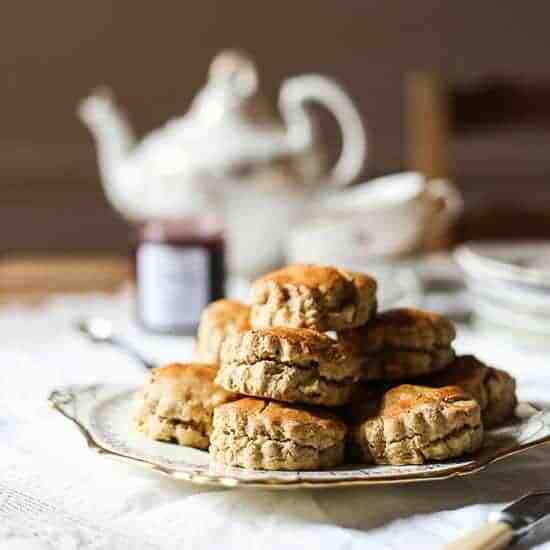 These scones are hitting all the right notes for me at the moment and are what I have been craving all week before I had even tried the recipe out. I woke up with a bang this morning knowing I wanted scones for breakfast. Yes, that’s what I had been missing all week and as soon as I realised that laying in bed at 6am they were the only thing that could possibly satisfy me. I tried eating a piece of toast only to give most of it to Cole when it just didn’t feel right. So after I bundled him off to nursery, I came back home, raided my larder and fridge for the right ingredients and 30 minutes later was enjoying the scone (ahem scones) that I had been craving. Do note that these are not sweet scones despite the fact that there is both apples and honey in the title. I would normally put about 60g of sugar in my scones but I just didn’t want that for my breakfast today so instead substituted the sugar with honey which tones down the sweetness of the scone immeasurably. 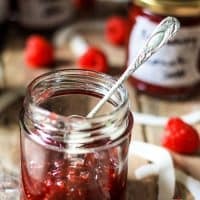 The burst of dessert apple in every mouthful also keeps the scones from feeling too savoury but really what you want here is to ladle your scones with the very best homemade jam. I ate mine slathered in last week’s Damson Orange Cinnamon Jam and the combination of spices and deep rich autumnal flavour was perfect. After I had eaten my fill of jammy scones I then attacked them with a generous slather of salted butter which was also excellent as the gentle spices and apples were given the chance to shine. I made the scones smaller than I normally would and just made a small batch of 12. I doubt they’ll last the day once a hungry husband and toddler come home but that’s all for the best as scones are only really worthwhile on the day they are baked. Sift the flours with the spices, baking powder and salt, then drop in the butter, rubbing together to form a breadcrumb texture. In a jug whisk the eggs into the milk with the honey and pour into the flour mixture. Stir together with a wooden spoon to bring together then turn out onto a clean work surface dusted with oat flour and using your hands gently turn the mixture round and round. As it is coming together sprinkle in the apple pieces bit by bit so they are evenly distributed. Carry on turning the dough a little longer until it forms a smooth dough which is no longer sticky. Press the dough out into an even round 1 inch thick and cut out the scones using 5cm round cutter. Place the scones on a large baking tray and brush the top of each scone lightly with whisked egg. Bake for 10 minutes or until the top of the scones are beautifully golden. for all my cookies, biscuits, scones. 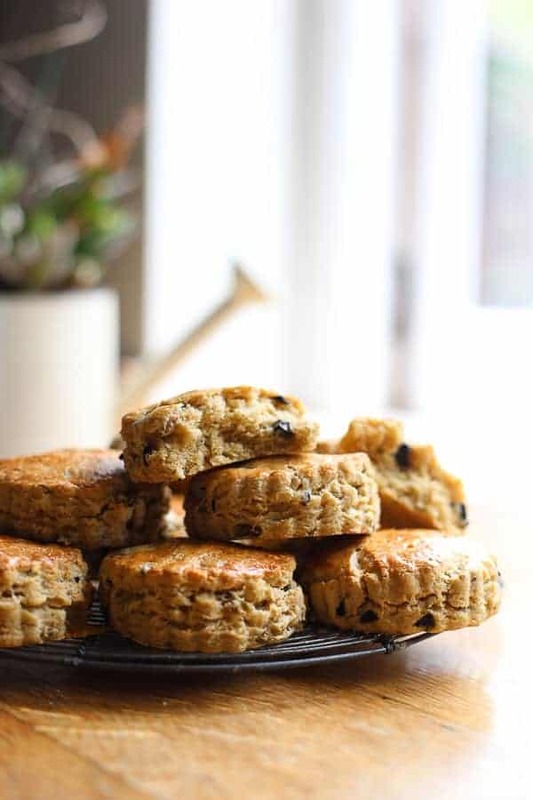 It’s non-stick so the scones lift off easily from the tray and doesn’t require any baking parchment or greasing.
. It’s more economical to buy it this way and I love Bob’s Red Mill as it’s certified gluten-free. 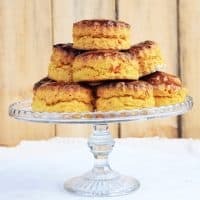 I love a good scone recipe! Apple and honey seem perfect as a pair, so I can’t wait to try these!